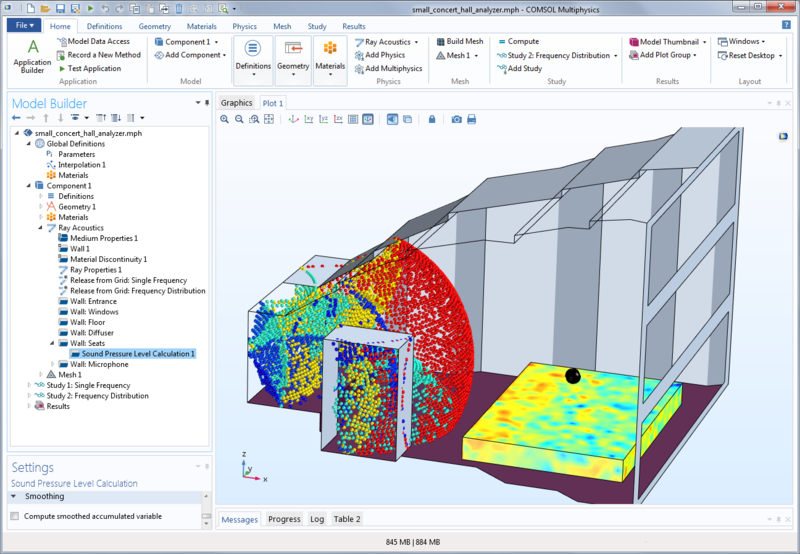 For users of the Acoustics Module, COMSOL Multiphysics® version 5.2a brings a new interface based on the discontinuous Galerkin method for ultrasound modeling, a new interface for analyzing propagating and non-propagating modes in small ducts, and a new Directivity plot type for loudspeaker analysis, to name just a few updates. Review all of the Acoustics Module news in more detail below. There is now a completely new interface for large acoustic simulations in the time domain using an explicit solver within the Acoustics Module. The interface is based on the discontinuous Galerkin method (also known as DG-FEM or simply DG) and uses a time-explicit solver, resulting in a very memory-efficient method. 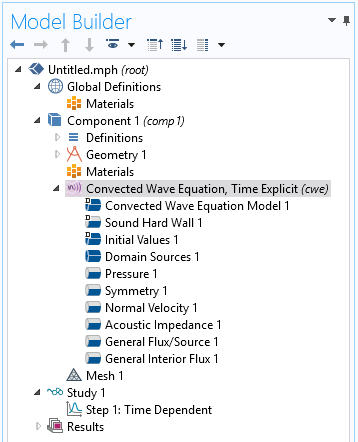 The new interface is called Convected Wave Equation, Time Explicit interface and can be found in the new Ultrasound node in the Model Wizard page when selecting the physics you want to model. Still image of the pressure pulse, with the absorbing (sponge) layers shown as the meshed domains. The interface is used to solve transient linear acoustic problems in cases with or without a stationary background flow over large distances relative to the wavelength. Application areas include ultrasound flow meters, ultrasound distance sensors, and other ultrasound sensors where time-of-flight is an important parameter. The applications are not restricted to ultrasound-based applications, but can also include transient propagation of audio pulses in room acoustics or car interiors. The Convected Wave Equation, Time Explicit interface also has an associated Absorbing Layers domain feature that is used to mimic an anechoic surrounding with a function that is similar to a nonreflecting boundary condition. The interface solves the linearized Euler equations assuming an adiabatic equation of state; the dependent variables are the acoustic pressure and the acoustic velocity perturbations. The background flow can be any stationary flow with small to moderate velocity gradients. No loss mechanisms are included in the interface. The model shown here is an ultrasound flow meter (time-of-flight configuration), where a 2-MHz signal propagates across a flow channel with an average velocity of 10 m/s. This 3D model is available in the Acoustic Module Application Library (called Ultrasound Flow Meter with Generic Time-of-Flight Configuration) and has 16 million degrees of freedom (DOFs) using 10 GB of RAM. An animation showing a continuous sinusoidal pressure pulse in the symmetry plane of the model. 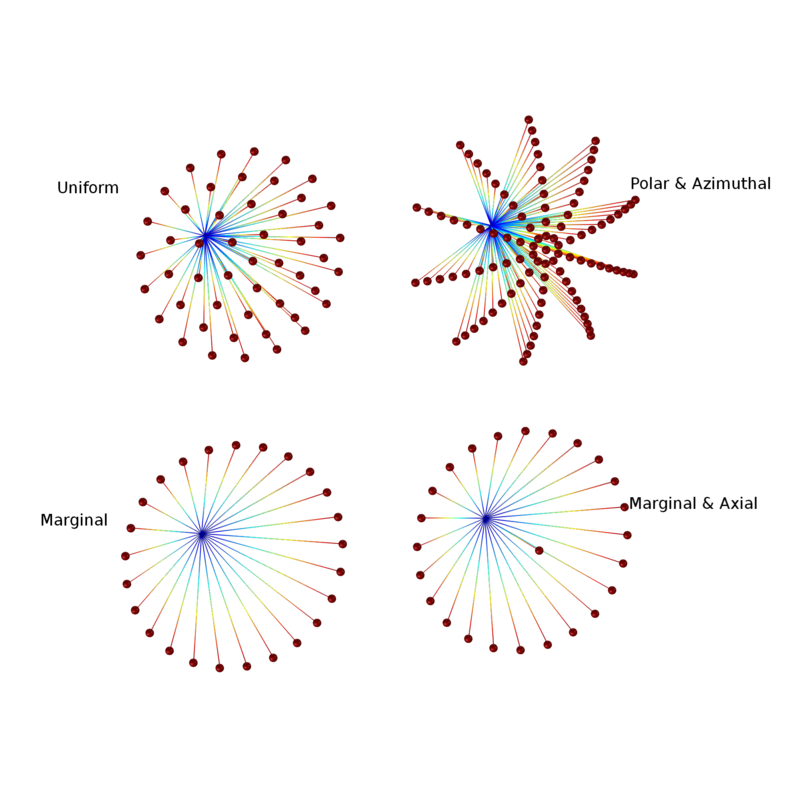 This animation shows a Gaussian pressure pulse in the symmetry plane of the model with added deformation. The waves are absorbed in the absorbing layers at the left and right side of the main flow channel. Convected Wave Equation Model: Defines the governing equations for the model. Sound Hard Wall: Defines hard boundaries/walls. Initial Values: Set up an initial value for the dependent variables. Domain Sources: Add a domain source to model external forcing applied to the fluid. Pressure: Defines a pressure source at an exterior boundary. Symmetry: Apply if symmetries exist in the model. Normal Velocity: Defines a source at an exterior boundary representing a vibrating surface such as a transducer, for example. 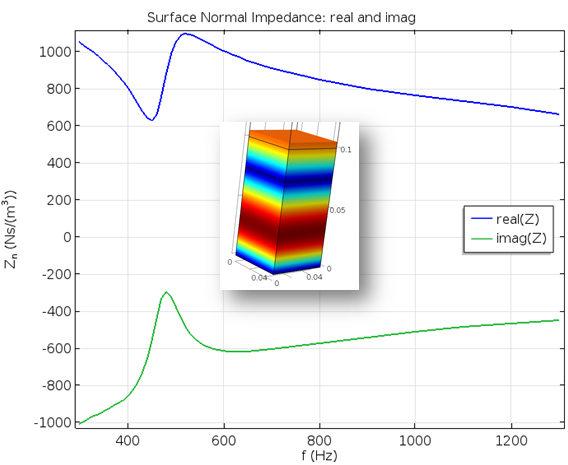 Acoustic Impedance: Use to model an impedance condition or as a simple radiation condition. General Flux/Source: Sets up a generalized flux, in the DG framework, on an exterior boundary. General Interior Flux: Sets up a generalized interior flux condition, given the DG framework. A scaling system that slows down the propagating waves. Filtering in the absorbing layer domain that kills high-frequency components. An exterior first-order nonreflecting condition (an impedance condition). When these are combined, the amplitude of spuriously reflected waves can be reduced by a factor of up to 1000. Shown here are animations from the new Gaussian Pulse in 2D Uniform Flow: Convected Wave Equation and Absorbing Layers tutorial model, where an outward propagating acoustic pulse is absorbed by the absorbing layers. 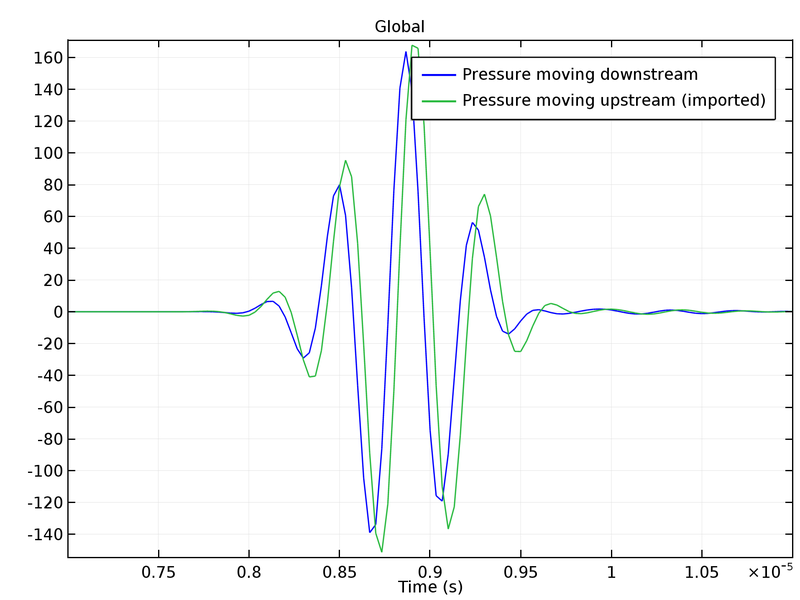 Animation of the pressure pulse from the "Gaussian Pulse...Absorbing Layers" tutorial model. Left: Animation of the full computational domain including the absorbing layers. Right: The physical domain only. Knowing the speed of a moving fluid is important in all cases where the fluid is used to transport material or energy. In the time-of-flight or transit-time method for determining flow speed, an ultrasonic signal is transmitted across the main flow in a pipe to noninvasively determine its speed. By transmitting the signal at an angle relative to the main flow, the ultrasound signal will travel faster than the speed of sound if it moves in the direction of the main flow, or slower than the speed of sound if it moves against it. The difference in travel times in the two directions increases linearly with the speed of the main flow. Flow meters of this type find many uses, particularly in industrial settings. 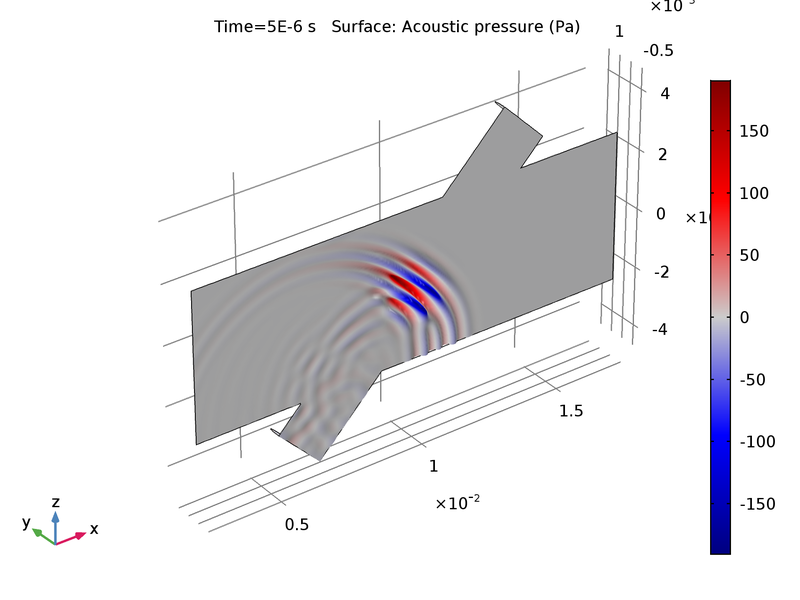 In this tutorial model, we illustrate how to simulate a generic wetted transient-time ultrasound flow meter in the Acoustics Module. The model setup solves the transient problem of a signal traversing the flow downstream. 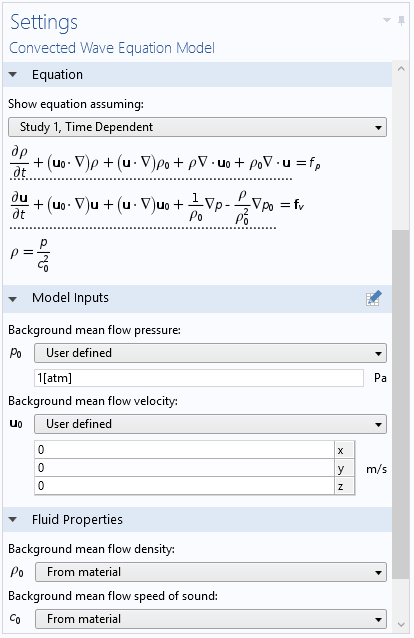 The model first uses the CFD Module to calculate the steady-state background flow in the flow meter. The signal moving upstream is precalculated and imported as data. The difference in arrival times is used to estimate the speed of the main flow. It uses the Convected Wave Equation, Time Explicit physics interface, found under the Ultrasound node, which is tailored to transient high-frequency situations. This interface is based on the discontinuous Galerkin method (DG-FEM). NOTE: This model requires the Acoustics Module and either the CFD Module or the Heat Transfer Module. Pressure distribution of the transmitted signal, depicted in the symmetry plane of the flow meter, at time t = 5 ms. The average pressure at the receiver for a pulse moving downstream and a pulse moving upstream. The time difference is used to calculate the average flow speed in the main channel. Left: Pressure distribution of the transmitted signal, depicted in the symmetry plane of the flow meter, at time t = 5 ms. Right: The average pressure at the receiver for a pulse moving downstream and a pulse moving upstream. The time difference is used to calculate the average flow speed in the main channel. This small tutorial simulates a standard test and benchmark model for nonreflecting conditions and sponge layers for linearized Euler-like systems. It involves the propagation of a transient Gaussian pulse in a 2D uniform flow. The Convected Wave Equation, Time Explicit interface solves the linearized Euler equations with an adiabatic equation of state and the interface uses the Absorbing Layers feature to model infinite domains. An acoustic pulse is generated by an initial Gaussian distribution at the center of the computational domain. The pulse propagates in a high Mach number uniform flow. An analytical solution exists to the problem and is used to validate the solution, and shows very good agreement. The model also shows how to set up and use the absorbing layers. The use of such absorbing layers can reduce spuriously reflected waves to 1/1000th of the incident field amplitude. The acoustic particle velocity of a convected Gaussian pulse as it impinges on the absorbing layer. 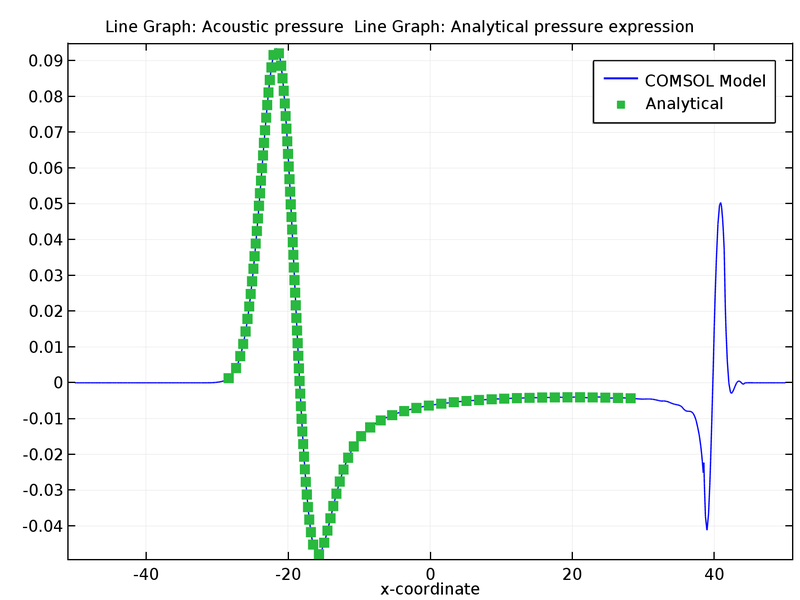 Comparison of the pressure profile of the COMSOL Multiphysics® model (blue line) and the analytical solution (green dots) in a cross section along the x-axis. The spike to the right represents the pulse inside the absorbing layer and has no physical meaning. Left: The acoustic particle velocity of a convected Gaussian pulse as it impinges on the absorbing layer. 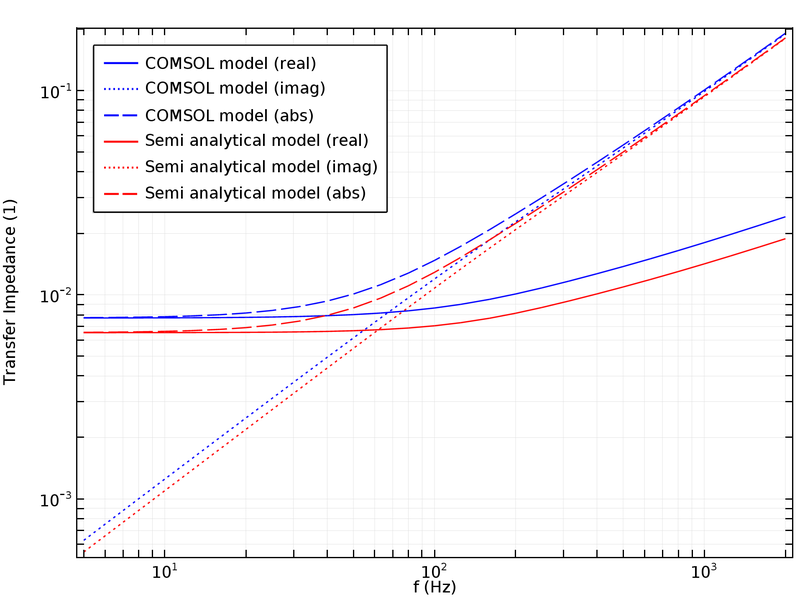 Right: Comparison of the pressure profile of the COMSOL Multiphysics® model (blue line) and the analytical solution (green dots) in a cross section along the x-axis. The spike to the right represents the pulse inside the absorbing layer and has no physical meaning. In acoustics analyses of smartphones and other small electronic devices of small geometric dimension, effects from viscous losses and thermal conduction are important due to the phenomena that exists in boundary layers near walls. The thickness of these layers is known as the viscous and thermal penetration depth. The Thermoviscous Acoustics, Boundary Mode interface computes and identifies propagating and nonpropagating modes in waveguides and ducts. The interface performs a boundary mode analysis on a boundary, inlet, waveguide cross section, or duct of small geometric dimensions. Included are the thermal and viscous losses, which are important effects in the acoustic boundary layer near walls. The interface solves for the acoustic variations in pressure, velocity, and temperature, as well as the out-of-plane wave number of the computed modes. An example of analysis of a 0.5-mm-by-2-mm waveguide. The plot shows the pressure for the first 3 modes at 100 Hz. An example of analysis of a 0.5-mm-by-2-mm waveguide. The plot shows the out-of-plane acoustic velocity for the first 3 modes at 100 Hz. An example of analysis of a 0.5-mm-by-2-mm waveguide. The plot shows acoustic temperature variations for the first 3 modes at 100 Hz. An example of analysis of a 0.5-mm-by-2-mm waveguide. The plot shows the pressure (left), out-of-plane acoustic velocity (center), and acoustic temperature variations (right) for the first 3 modes at 100 Hz. The first (propagating) mode is at the image applied to the geometry surface with wave number kn = 2.58-1.31i 1/m, the next two are evanescent modes with wave numbers 2970.6-7134.7i and 2904.8-7635.9i, respectively. The colors do not have the same scales. In addition to systems with small ducts, like hearing aids and mobile devices, the Thermoviscous Acoustics, Boundary Mode interface can be used to identify the propagating wave number and characteristic impedance of a duct cross section. This information can then be used in the next step of an analysis as input to the homogenized Narrow Region Acoustics feature of the Pressure Acoustics, Frequency Domain interface. The interface is available in 3D and 2D axisymmetric models and is applied at boundaries. It solves the equations defined by the linearized Navier-Stokes equations (linearized continuity, momentum, and energy equations), in quiescent background conditions, searching for the out-of-plane wave numbers at a given frequency. The Thermoviscous Acoustics interfaces now has a scattered field formulation option. This enables you to add a background acoustic field to a model. The background field can be either User defined or a Plane wave formulation. For User defined, you define an expression for the pressure, acoustic velocity, and temperature variation. These can also be taken from the solution of another acoustic model that defines the background field. The Plane wave option defines a plane traveling wave with physically consistent viscous and thermal attenuation. 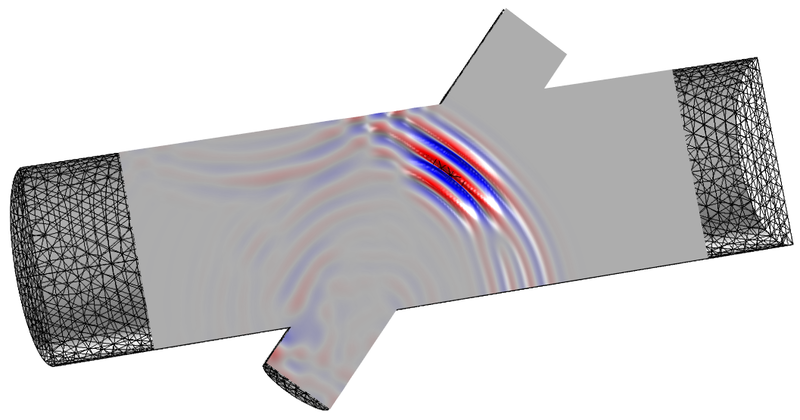 Using this new feature, you can create simple sources when modeling transmission problems where thermal and viscous losses are important, or study the scattering of small objects (small compared to the acoustic boundary layers). As an advanced application example, the feature can be used in conjunction with the Thermoviscous Acoustics, Boundary Model interface to create sources at the inlet of waveguides. 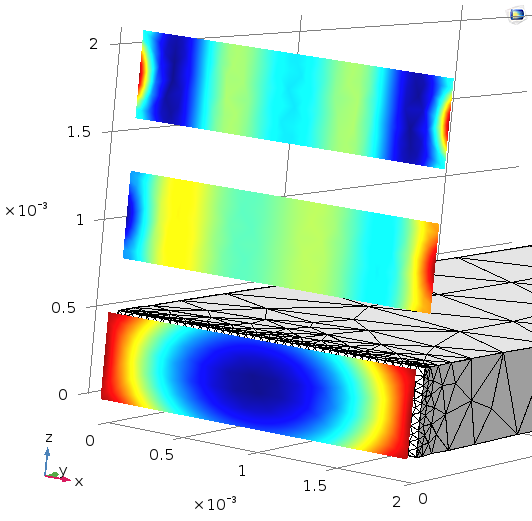 Result taken from the Transfer Impedance of a Perforate tutorial model, where the incident field on one side is applied using the new Background Acoustic Fields feature. The color plot shows the acoustic velocity inside the holes of a perforated plate and the line plot shows the transfer impedance as calculated by COMSOL Multiphysics® compared to a semianalytical model. Perforates are plates with a distribution of small perforations or holes. They are used in muffler systems, sound absorbing panels, and in many other places as liners, where it is important to control attenuation precisely. As the perforations become smaller and smaller, viscous and thermal losses become more important. The attenuation behavior, which is also frequency dependent, can be controlled by selecting the perforate size and distribution in a plate. While perforates have been theoretically studied for many years, analytical or semianalytical models can only be applied for simple geometries. A numerical approach is necessary for systems where the holes have various cross sections, if the perforations are tapered, or if the distribution of holes is uneven. 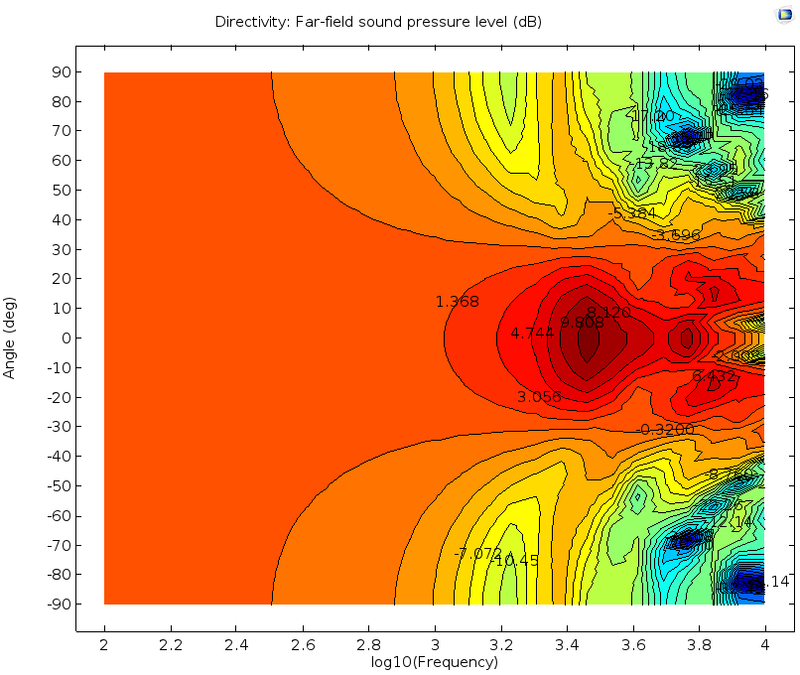 In this tutorial model, the effects are modeled in detail using the Thermoviscous Acoustics, Frequency Domain interface. While nonlinear loss mechanisms occur at high sound levels or in the presence of a flow (through or over the perforate), only the linear effects due to viscosity and thermal conduction are studied in this tutorial model. The transfer impedance, surface normal impedance, and attenuation coefficient of the system are determined. The transfer impedance is compared to a semianalytical model. The transfer impedance calculated in this detailed model can be applied to a larger system simulation using the interior impedance condition that exists in the Pressure Acoustics, Frequency Domain interface. Comparison of the transfer impedance of the perforated plate, modeled with the Acoustics Module, and a semianalytical model. The graph shows the real, imaginary, and absolute values of the transfer impedance. Acoustic temperature fluctuations inside the perforation. The thermal boundary layer is clearly visible. Left: Comparison of the transfer impedance of the perforated plate, modeled with the Acoustics Module, and a semianalytical model. The graph shows the real, imaginary, and absolute values of the transfer impedance. Right: Acoustic temperature fluctuations inside the perforation. The thermal boundary layer is clearly visible. 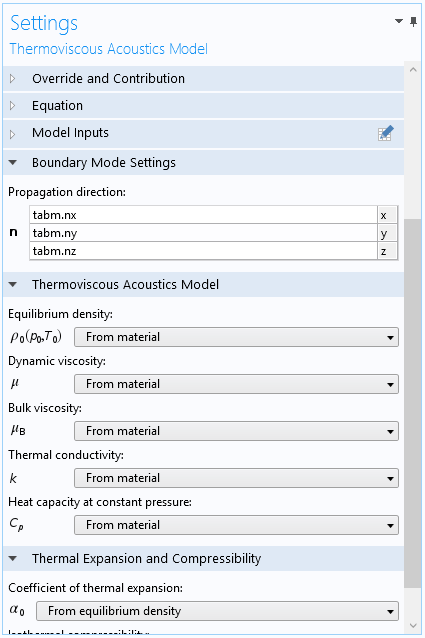 In COMSOL Multiphysics® version 5.2a, all of the Thermoacoustics interfaces have been renamed Thermoviscous Acoustics. These interfaces are dedicated to the detailed modeling of thermal and viscous acoustic losses in problems with small geometrical dimensions, i.e., in problems where the losses in the thermal and viscous acoustics boundary layers are important. Examples of such cases include the modeling of microphones, mobile devices, hearing aids, miniature transducers, and much more. Thermoacoustics is a term used in an existing branch of acoustics, dealing with cooling or heating using acoustic waves. Therefore, Thermoviscous Acoustics better describes the physics these interfaces are modeling. Normalization: The input sound pressure level data can be normalized either with respect to a specific polar angle, with respect to the maximal value (at each frequency), or with no normalization. Evaluation: The evaluation circle can be defined at any location in space and it is possible to define a reference direction that sets the 0-degree direction. Coloring and Style: Format the data as filled surfaces, lines, and add labels. It is also simple to switch the layout of the axis and have the frequency on either the x- or y-axis. An example of a Directivity plot where the data is normalized with respect to 30 degrees, the frequency is on the x-axis, and labels have been added to the plot. An example of a Directivity plot where the data is normalized with respect to 0 degrees, the frequency is on the y-axis, and labels have been added to the plot. An example of a Directivity plot where the data is normalized with respect to 30 degrees, the frequency is on the x-axis, and labels have been added to the plot (left). The same data normalization has been applied at 0 degrees and the frequency is on the y-axis (right). The Linearized Navier-Stokes, Frequency Domain and Linearized Euler, Frequency Domain interfaces now utilize a scattered field formulation option. This option enables you to add a background acoustic field to a model. The background field can be entered as user-defined expressions for the pressure, the acoustic velocity, and the temperature variation. This can be analytical expressions defining a certain type of wave, but it can also be the solution of another acoustic model. 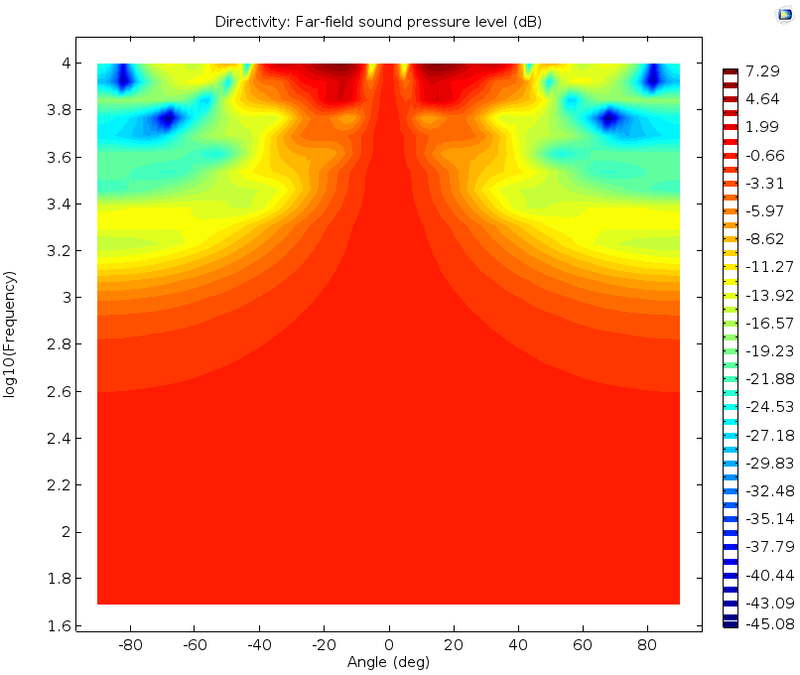 Originally called the Incident Acoustics Fields feature in the Linearized Euler interface, it has now been updated and improved and is known as the Background Acoustics Fields feature. For the Ray Power option, you can add a Sound Pressure Level Calculation to the Wall conditions. 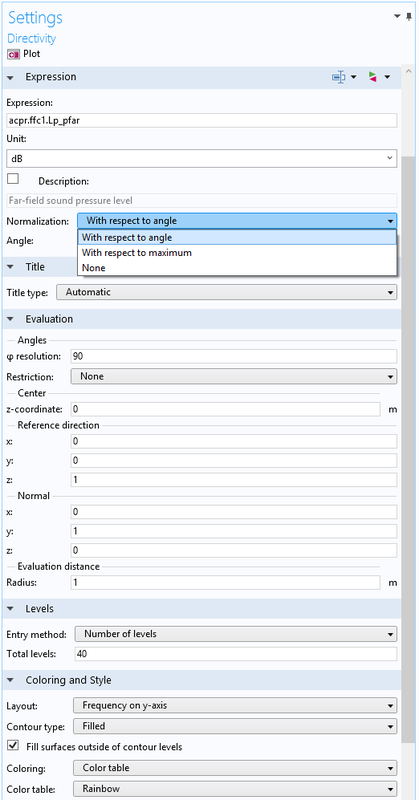 This new feature calculates the surface sound pressure level, including the effects of surface properties, such as the absorption coefficient. You can easily use the Results node to plot these variables. 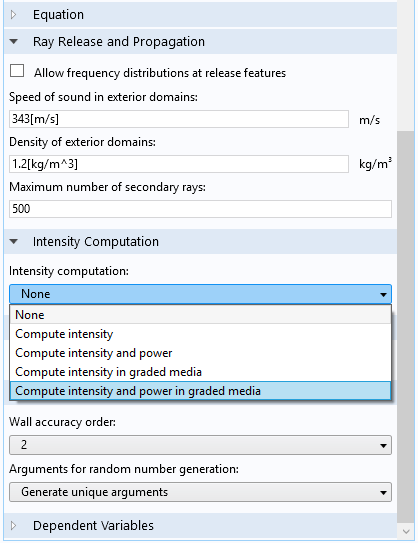 The new ray power computational option for Ray Acoustics; the Settings window where the options for Intensity computation can be selected. A screenshot from the Small Concert Hall Acoustics tutorial model with the Sound Pressure Level Calculation node highlighted. The new ray power computational option for Ray Acoustics: the Settings window where the options for Intensity computation can be selected(left), and a screenshot from the Small Concert Hall Acoustics tutorial model with the Sound Pressure Level Calculation node highlighted (right). The Ray Acoustics interface no longer requires a mesh if the medium has homogeneous properties (nongraded media). In this case, the material parameters for an ambient medium can be defined globally. The only requirement is that a model includes at least one boundary condition, such as a wall or a material discontinuity. Rays can propagate over long distances in unmeshed geometries and can even be released and propagate outside the geometry model. This could, for example, be used in large concert hall simulations. Several new options are available when releasing rays with a conical distribution of initial directions. You can release rays with a uniform density in wave vector space, so that each ray subtends the same solid angle. Alternatively, you can specify the density of rays in the polar and azimuthal directions separately. Built-in options are also available to release marginal rays only, with or without an axial ray. In the Pressure Acoustics, Frequency Domain interface, the Background Pressure Field and the Incident Pressure Field features (subnodes to the radiation conditions) have been extended to include cylindrical and spherical waves. This makes it easy to set up complex incident or background acoustic fields. Fields that are generated by exterior point sources or small vibrating bodies can be approximated by a monopole-type source. 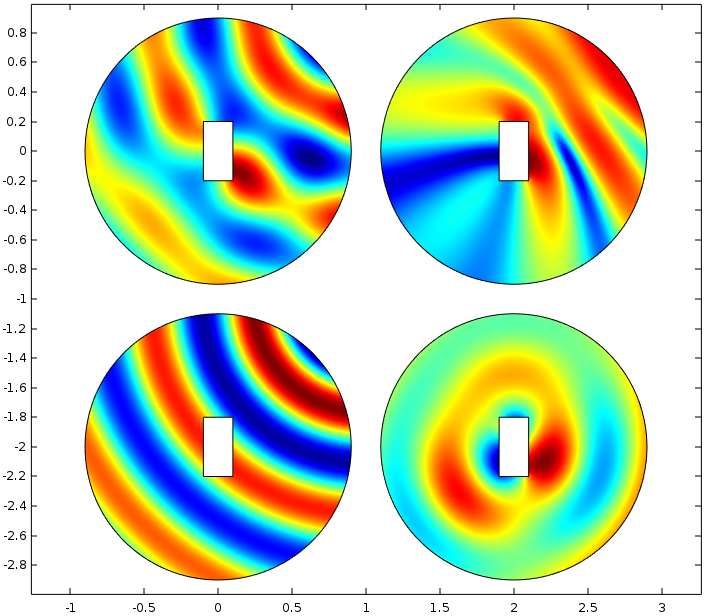 Select Cylindrical wave or Spherical wave pressure field types for pressure acoustics. A 2D scattering example; clockwise from top left is the total acoustic pressure field, total sound pressure level, the scattered pressure, and the cylindrical background pressure. 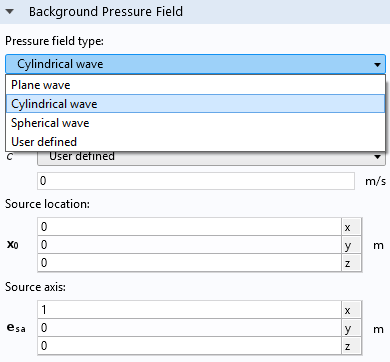 Left: Select Cylindrical wave or Spherical wave pressure field types for pressure acoustics. Right: A 2D scattering example; clockwise from top left is the total acoustic pressure field, total sound pressure level, the scattered pressure, and the cylindrical background pressure. New features have been added and improved that simplify and extend the electromagnetic couplings used in transducers, such as coils. This is important when modeling loudspeaker drivers. The Coil domain feature now supports velocity (Lorentz terms) in 3D and in 2D axisymmetry. In structural mechanics applications, the Lorentz force contribution can be picked up automatically as a Body Load. This is demonstrated in the Loudspeaker Driver model in the Application Gallery and the Application Libraries. The Loudspeaker Driver model features new electroacoustic couplings. The Loudspeaker Driver model has been updated and now uses the new automatic electromagnetic couplings between the moving coil and the magnetic field. The velocity (Lorentz term) has been added to the Coil domain and the Lorentz force contribution is picked up by the structural Boundary Load feature. 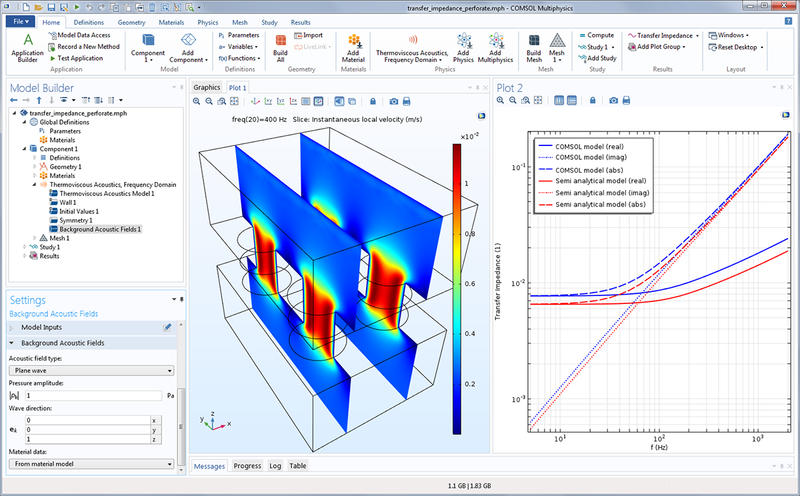 The new functionality eliminates the need for user-defined equations to model this type of multiphysics coupling. NOTE: This model requires the Acoustics Module and the AC/DC Module. Logarithmic: Enter the start and stop frequency and the number of frequencies per decade. 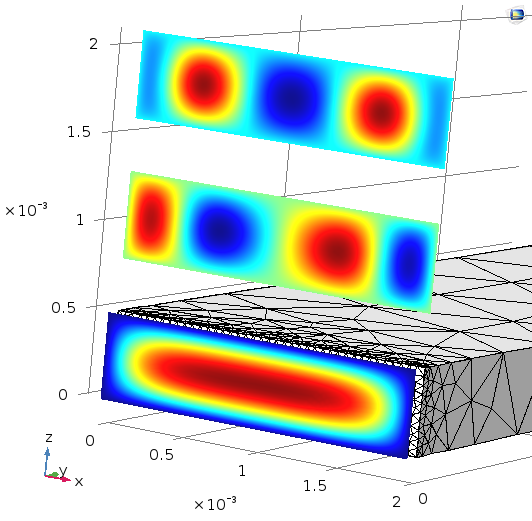 This feature is available in COMSOL Multiphysics® and requires no add-on product. 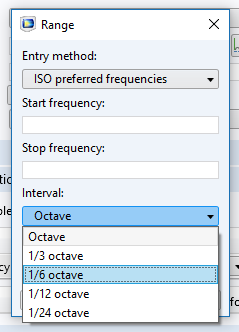 ISO preferred frequencies: Select a start and stop frequency and the desired interval (Octave, 1/3 Octave, 1/6 Octave, 1/12 Octave, and 1/24 Octave). The definition of the 1/3 octave preferred frequencies is based on the ISO 266 standard. The standard option is extended to frequencies based on the preferred numbers of ISO 3 (series R20, R40, and R80) to define 1/6 Octave, 1/12 Octave, and 1/24 Octave intervals. Note that you must select Show > Advanced Study Options in the Model Builder toolbar to use this. The option Enable/disable PMLs in the solver is useful for modeling scattering problems where the source is a computed field. The user-defined geometry type option is available if the PML has a nonstandard geometry, and can also be used if the automatic PML geometry detection fails. 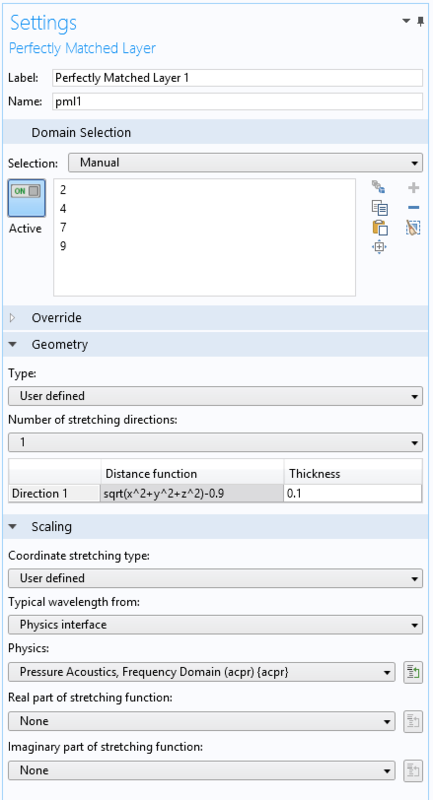 You can choose user-defined coordinate stretching functions for defining the PML scaling. This allows you to tailor the scaling inside a PML, for example, to very efficiently absorb waves in specific physics configurations. Updated Far-Field plots with a new option to specify the reference direction that defines the 0-degree angle. 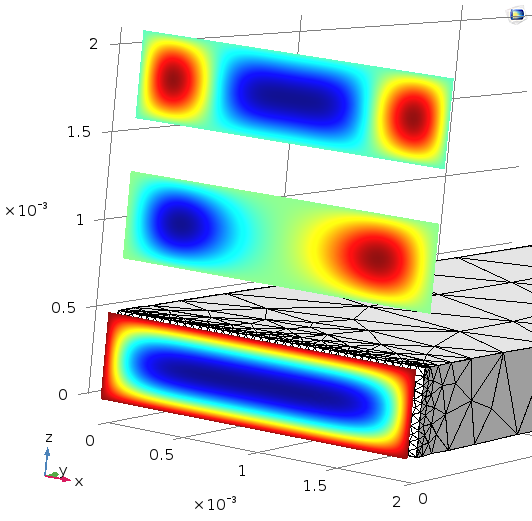 Calculate temperature option in the Compressible Potential Flow interface. The Compressible Potential Flow interface has two new boundary conditions: Interior Wall (Slip Velocity) and Mean Flow Velocity Potential. Moreover, there is now an option to automatically calculate the temperature field in the flow. This is used when setting up the background flow for a Linearized Potential Flow Model. The Heat Flux condition is used when a pulsing heat source generates acoustic waves. The Interior Temperature Variation condition is used for modeling applications such as a thin plate with a harmonic temperature variation that is generated by resistive heating from a pulsing current. Along with the renaming of the Incident Acoustics Fields feature to Background Acoustics Fields in the Linearized Euler interfaces, all variables with the suffix_i are changed to _b. The names of the time-derivative variables in the Linearized Navier-Stokes and Linearized Euler interfaces have been changed from p_t to pt, u_t to ut, rho_t to rhot, and T_t to Tt. 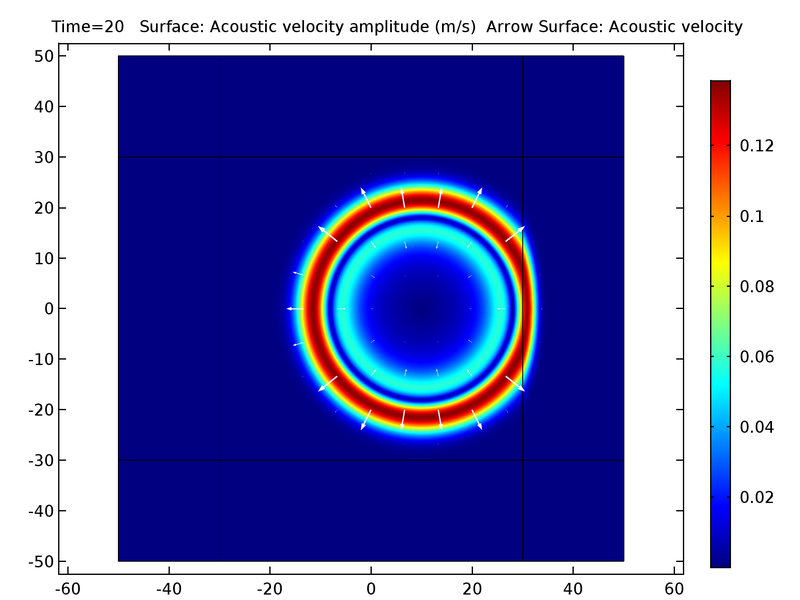 Add two contributing point sources in the Acoustic Diffusion Equation interface. Recent advances in the fabrication of microfluidic systems require handling of live cells and other microparticles, as well as mixing. All this can be achieved using acoustic radiation forces and the viscous drag from a streaming flow. Streaming: Due to the nonlinear terms in the Navier-Stokes equations, harmonic perturbation of the flow will lead to a net time-averaged flow called acoustic streaming. or as shown here, by separation of time scales. Radiation Force: Due to nonlinear terms in the governing equations, momentum can be transferred from an acoustic field to particles. This results in a net force acting on the particles — the acoustic radiation force. The trajectory of particles in devices will be governed by the balance between the viscous drag force (from the streaming flow) and the acoustic radiation force. This model shows how to include and model both of these using the Acoustics Module in COMSOL Multiphysics®. The acoustic streaming flow inside the microchannel cross section. Left: The acoustic streaming flow inside the microchannel cross section. Right: An animation of the microparticle trajectories under the influence of streaming flow drag and radiation forces. In applications where pressure waves and elastic waves propagate in porous materials filled with air, both thermal and viscous losses are important. This is typically the case in insulation materials for room acoustics or lining materials in car cabins. They also occur in porous materials in mufflers in the automotive industry. In many cases, these materials can be modeled using the Poroacoustic models (equivalent fluid models) implemented in the Pressure Acsoustics interface. 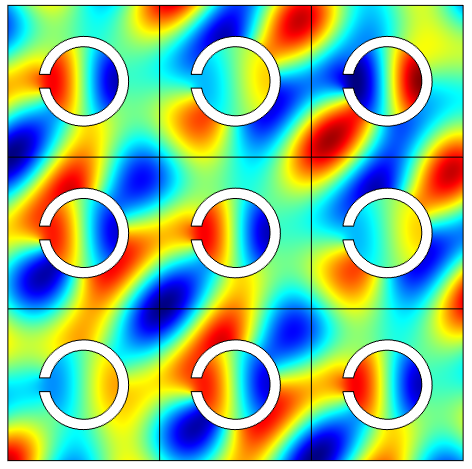 The Poroacoustic models do not capture all effects, so sometimes it is necessary to also include elastic waves in the porous matrix. This is covered by the so-called Biot-Allard theory for modeling poroelastic waves. The Poroelastic Waves interface of the Acoustics Module is based on the classical Biot theory used in the field of Earth sciences. This model assumes that the saturating fluid is a liquid (water), and only includes viscous losses. The material inputs are also different from those typically supplied with acoustic insulation materials. The present models shows how the Poroelastic Waves interface can be tailored to include the thermal and viscous effects as described by the Biot-Allard theory. Surface normal impedance of a single porous layer. The curves include both thermal and viscous losses in the fluid as well as the mechanical deformation of the porous matrix. Phononic and sonic crystals have generated rising scientific interest for very diverse technological applications. These crystals are made of periodic distributions of scatterers embedded in a matrix. Under certain conditions, acoustic band gaps can form. These are spectral bands where propagation of waves is forbidden. 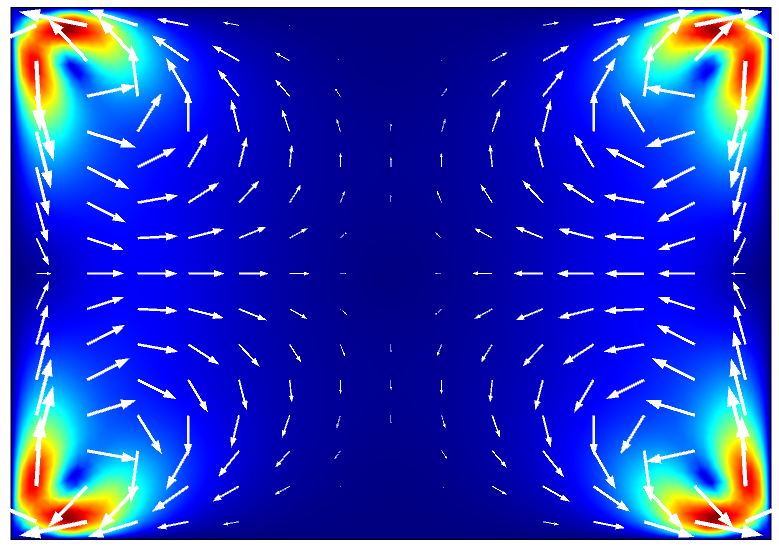 This tutorial model first analyzes a sonic crystal and determines its band structure. Then, the model analyzes transmission loss through a finite-sized crystal and compares the results to the band structure. Periodic pressure field inside the sonic crystal structure. The periodicity is enforced using the built-in Floquet (also known as Bloch) periodic conditions. Over the previous millennium, sound holes in violins have gone from being circular in shape to being elongated. 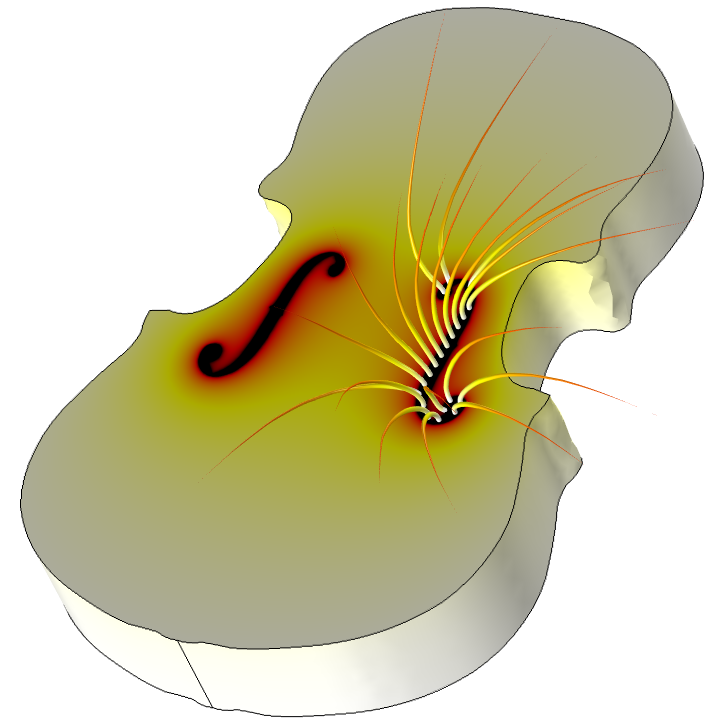 Most of the sound from low notes emitted from a violin radiate out through these elongated holes. The violin's vibrating body provides sound at higher frequencies, but also resonates the air inside of it. Two tutorial models are presented in the Application Gallery entry. 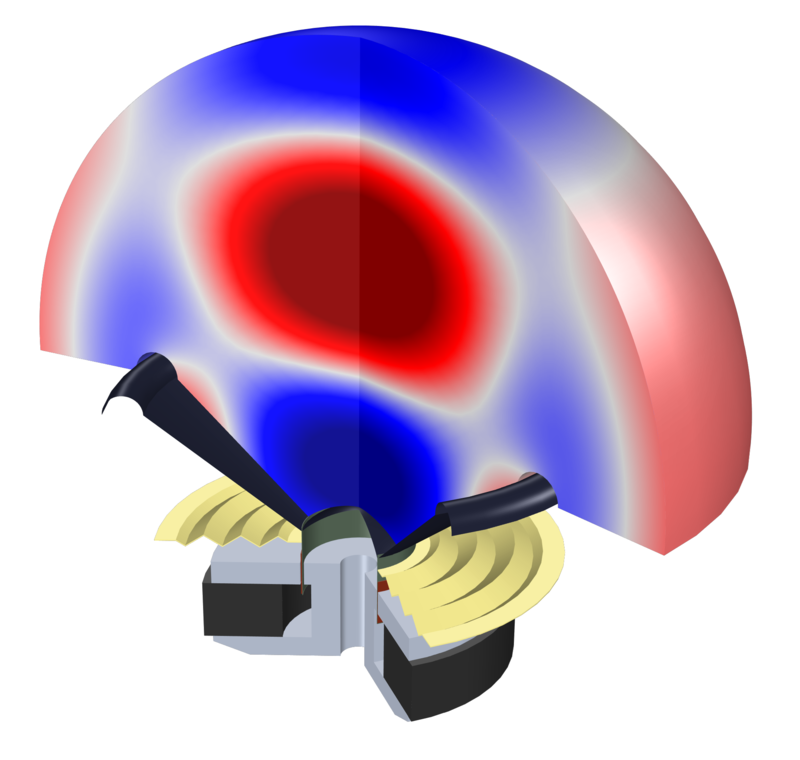 The first one applies acoustic-structure interaction to study how the air mode resonance is affected by the coupled vibrations in the violin body. The other uses a potential flow approximation to investigate how air flow through the elongated holes relate to their shape. 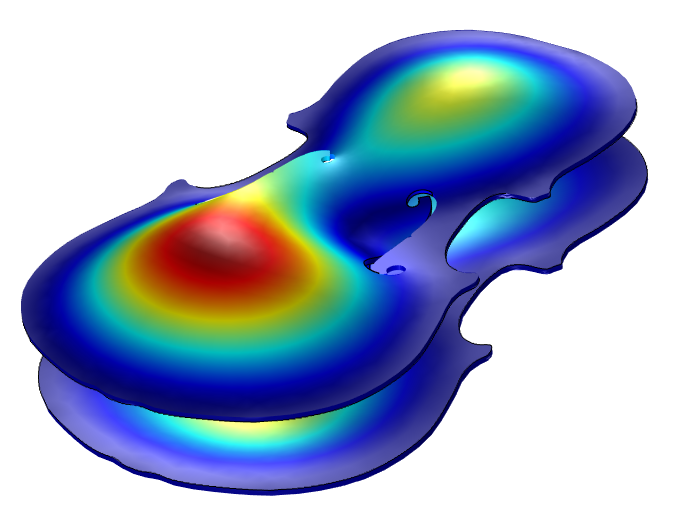 These models are described in far more detail in the blog post titled "Analyze Violin Tone and Volume with Multiphysics Modeling". The first mode, here at 300 Hz, of a coupled violin and acoustics model. The airflow through the f-holes in the violin. The flow is simulated as a potential flow. Left: The first mode, here at 300 Hz, of a coupled violin and acoustics model. Right: The airflow through the f-holes in the violin. The flow is simulated as a potential flow. Sound that propagates in structures with small dimensions become affected by viscous and thermal losses near the walls. Such losses need to be included when modeling the acoustic behavior of such structures. This tutorial model studies energy conservation in a conceptual test setup with an inlet and outlet and containing a Helmholtz resonator with a very narrow neck. The acoustics in the narrow neck is modeled with the Thermoviscous Acoustics interface, for a detailed analysis of the thermal and viscous losses. In order to study and verify energy conservation, the model compares the total dissipated energy in the acoustic boundary layer with the total input minus output power of the system. A more detailed discussion of the theory of thermoacoustics can be seen in the blog post titled "Theory of Thermoacoustics: Acoustics with Thermal and Viscous Losses". 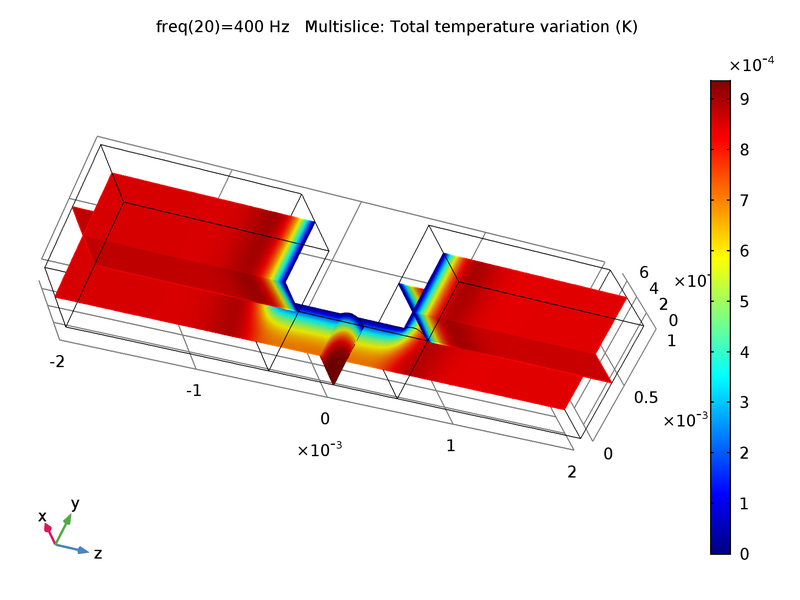 This tutorial illustrates a modeling approach for deriving physically consistent simplified models in the Acoustics Module. The approach consists of converting complex subcomponents to an impedance boundary condition and otherwise using simple acoustics throughout the model. As a consequence, significant computational speedup can be achieved. The example treated here consists of a simplified muffler-like system consisting of a main duct and a Helmholtz resonator (the subcomponent). The acoustics in the resonator are modeled with thermoviscous acoustics, because viscous and thermal losses are important. The aim is to lump the thermoviscous acoustic domain with an impedance model. The tutorial model gives step-by-step illustrations detailing how to derive impedance boundary conditions in a complex acoustics model, as well as how to call this impedance in a new, simple model. In addition, the model details how to use the Optimization Module to fit the derived impedance to an RCL model. The documentation discusses how this second approach can be used to derive additional insight into the modeled system.